I’ve wanted a proper hat for quite a while. But two things held me back. First, it’s an unusual item for a young man to wear today and stands out. Wearing it well would require careful balancing with other clothes and some nerve while I got used to it. Second, I have a rather long head (dolecephalic) requiring any hat to be large and making it hard not to overwhelm my face and shoulders. Bike helmets just look silly. If I was to wear a proper hat, most likely a trilby or a fedora (generally speaking, narrow or wide-brimmed respectively), it would have to be casual enough to wear with jeans and a shirt as well as a suit. So probably a soft, brown felt, with a narrow ribbon and minimal bow. I’d looked around for a few years without much enthusiasm. But then a chance encounter in Madrid a couple of weeks ago turned my fortunes. Like many European cities, the best menswear shops in Madrid specialise in selling English style to the locals. This one had Hackett shirts, Drake’s ties and Penhaligon’s perfume, alongside the standard woven belts and driving shoes. 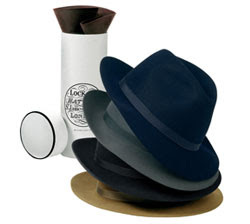 But it also stocked Lock & Co hats, and the Voyager Sombrero in size 7 3/8 seemed to fit the bill perfectly. I waited until I could go to Lock & Co in London, finally getting over to St James’s Street last week. Retail manager Andrew Baselgia was immediate and exact in his analysis: ‘you have a long head so you need a larger size, but the brim needs to be smaller to avoid it overbalancing you,’ he said. He went straight for the 7 3/8 Voyager (there’s no Sombrero suffix in the UK) when I said I wanted a soft, brown and casual hat. It looked (300) great and, to be honest, I felt a little ashamed that I had put off buying a hat like this for so long. Perhaps it had more to do with social norms than I would have liked to admit. The Voyager also rolls up for travelling abroad, which is perfect for me when going away for business. You just have to push out the crown, fold down the brim all the way around, and gently fold the hat in half to form a concave curve. You then roll that curve up, making it much easier to carry and store. Though to be honest, I’ll be taking quite a bit of pleasure in storing it at home in the distinctive Lock white hat box that came with it. You can follow the discussion on My very first hat by entering your email address in the box below. You will then receive an email every time a new comment is added. These will also contain a link to a page where you can stop the alerts, and remove all of your related data from the site. Congratulations on your hat! I’ve stuck to flat caps for quite some time (called a ‘cheesecutter’ by a Scottish friend for some reason, any ideas?) but a recent gift of a heather grey/olive fedora, along with the encouragement of friends, pushed me to risk what you might call a ‘proper’ hat. What a wonderful item! Please post pictures of your recent acquisition – I’ve come to think that it’s something a younger man can wear well without appearing either ironic or inappropriately aged. The triby on sale in M and S would have been perfect for ou.Its 16 pounds. I bought a gangster style hat at the shop you just wewnt to, I had it made to measure, never wear it. Yes, they take some getting used to and the first few trips out the door you will feel conspicuous. But once over the hump, you’ll never look back. Remember that like a good suit, the more you wear it, the more it becomes your own. Nice hat, Simon! If you ever have the pleasure of visiting Chicago, Optimo Hats (www.optimohats.com) makes the finest bespoke hats in the world. It takes about 5 weeks to make a beaver felt hat to a customers measurements and material specifications. My first one should be ready next week. Can’t wait! well seeing as London has the finest hat ,makers in the world I don’t think he needs USA stuff although the hats on sale inMillers are nice. But as I said wearing a hat makes you look like a dope especially if the hat is a very fine one like the one simon is getting.Mine cost a lot but unfortunately this is not the era of hats.Its also a forced fashion these days.I love hats but there you go. Congratulations on finally taking the plunge! I have been a daily hat wearer for years, and while I’m a bit older than you, I started young. Like you, my head is also long and thin, but over time, hats will shape themselves to your noggin. You can also wear them in the rain to speed the process. While I do get the occasional odd glance while wearing a hat, I mainly get compliments. Given that young men are more interested in suits and ties than their parents, they may just take to wearing hats, too. Here’s what it boils down to: are you man enough to look & feel good, regardless of what’s fashionable? If so, then man up–and don a hat! hi simon, could you recommend things to wear with a classic brown trilby? ive seen it worn with a suit and a tweed jacket, but could you wear it with a classic blue blazer & grey flannels for example without it looking out of place (guess this is perhaps a more summer look so perhaps would be out of context, not really sure)?